The groups that participated in this year’s Pride in Our Community Competition came from all corners of the county to attend the Awards in Oriel House Ballincollig. The judging team were very impressed this year with the high standard of the projects that were involved and found it very difficult to choose an overall winner but the Lusitania Museum/Old Head Signal Tower Heritage Group won the Pride of County Cork Award. Their project was the restoration of the Signal Tower and the construction of a Lusitania Memorial Garden with iconic sculpture. Cllr Daithi O’Donnabhain praised Pride of County Cork Winner, Lusitania Museum/Old Head Signal Tower Heritage Group, all the winners of the other categories and all those who entered the competition this year. He said that it was great to see the effort being put in by community groups in developing projects that highlight the wonderful county we live in. 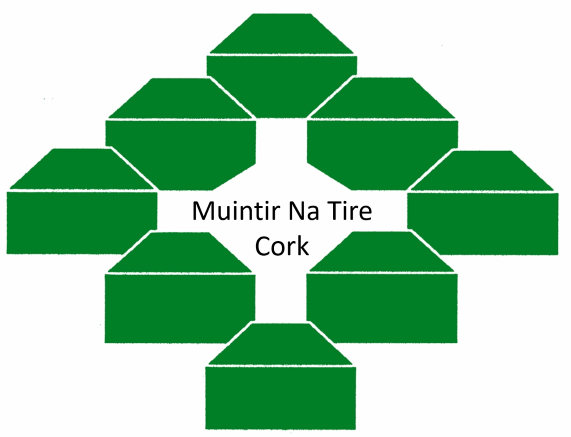 He thanked Muintir na Tire for organising the competition and said ‘this great competition rightly recognises and rewards community groups who develop and maintain locally-based Amenity/ Projects which are of long-term benefit to the local community’. Sean Murphy President of Cork County Federation Muintir ná Tíre said these projects highlight the important link between our surroundings and our quality of life. It is no co-incidence he said that people travel the length and breadth of the county, visiting beauty spots – beautiful scenery that lifts their spirits and hearts. The impact that amenity projects developed are enormous he added. He said community projects like those developed by the Lusitania Museum/Old Head Signal Tower Heritage Group make towns and villages much better places to live. He thanked Cllr O’Donnabhain and Cork County Council for providing support for all of the groups in bringing this principle home. He said these projects also brighten up communities and enhance the natural beauty of the surroundings in which we live as well as attracting tourists. Best Project in Large Town South Cork. Best Project in Large Town West Cork………………. Cobh Tidy Towns who designed, produced and erected signs on the approach to Cobh to help counteract the litter problem in the area. They also refurbished the 32 seats along the walkway by replacing the existing rotting wooden structures with recycled and maintenance free plastic structures. · Kinsale Tidy Towns who restored some Nautical Artefacts and placed them around the museum. Ballincollig Tidy Towns who built a permanent composter for composting of leaves, grass and green materials. (1) Oysterhaven & Nohoval Residents Association who upgraded the Ship's Anchor situated at the entrance to the beach in Oysterhaven. Rathbarry Tidy Towns who erected a Wildlife Information Sign on the river walk and provided new Picnic Tables. Killeagh/Inch Historical Group who are developing a Heritage Trail in Killeagh with the erection of Information Boards at the Medieval Graveyard, Barrack House and the Old Mills. (1) Transition Town Kinsale who developed a Community Orchard by planting fruit and nut trees, soft fruit bushes, native hedging, herbs and flowers. Their aim is to provide a sanctuary for biodiversity and to create a space for learning. (2) Conna Tidy Towns who developed a new village cross with parking, seating, sculpture, wheelchair access and sustainable planting. Installed a bee and butterfly garden. Erected new village signs. Refurbished the church car park and refurbished the outdoor ball alley. (3) Banteer Tidy Towns who cultivated a wild flower bank to encourage birds, bees and insects to inhabit the area. Coolagown Community Association who planted a Pollinator Friendly mini orchard consisting of native fruit trees and other wildflowers. (1) Dunmanway Community garden who further developed the Dunmanway Community Garden by adding a wheelchair accessible polytunnel, wheelchair accessible raised beds, sensory pergola and touch beds. Cobh Playground who set a goal of raising €180,000 to build an all purpose multi functional playgroung. Mournabbey Community Council built an astroturf pitch and a new playground for the community. All this was achieved without incurring debts. (1) Newcestown Community Association who developed signage in the village to assist in road safety. They are in the process of developing a footpath and walking trail around the village. · Kilmeen & Castleventry Development Association who developed Gearagh Park by adding picnic benches and seating to this beautiful and peaceful area. · Castle Close Residents Association who planted a shrubbery at the entrance to the estate and erected a sign to Blarney by the local scout hall. Glanworth Community Development Group who developed a children's playground in the village. This is the first phase in an ambitious three-phase development to increase outdoor participation amongst all generations in the community. (1) Croi na Laoi Inchigeela who mapped 7 local scenic routes by erecting signposts along each route and a large map board in the village and also printed information leaflets. (2) Schull Tidy Towns A co-operative effort between Tidy Towns and Community Council, Creation of a series of looped and Linear Walks to cater for the needs of young and old, active and less active, Thousands of international flyers were also designed printed and distributed. (4) Brand Blarney developed a website and a heritage webtrail, which shows all that Blarney and district has to offer. Waterloo Renewal Group who erected a series of directional walking signs to encourage an increase in walking around the area. Roscarbery Tidy Towns who erected a new name stone on the approach to Roscarberry and placed a sculpture nearby made of upcycled material. These are lit up at night by power from a solar panel, they also planted a sustainable shrub and flower patch at the base. (1) Ballygarvan Community Association who cleaned up the village and planted flowers throughout the area, expanded the range of activities in the Community Centre to meet the needs of the whole community and developed a village website and linked it to Facebook. Dripsey Tidy Towns who erected new signage to Model Village and Dripsey Castle. Coachford approach Road-The Cottage. Who installed a seat at Jamesbrook strand to encourage community spirit and social interaction and to facilitate walkers and surfers in their enjoyment of the local scenery. This is part on an ongoing project to develop and promote their beautiful location. Kildorrery Community Garden Group who further developed the Community Garden by extending the composting area to facilitate taking grass cuttings from the Senior Citizen's Complex and Village Park and balancing it with cardboard and waste from the local restaurant. Grenagh Tidy Towns who developed a sensory garden in honour of a late teacher of the school, Ms.Mccarthy. Ballineen & Enniskeane Tidy Towns A replica train and carriages was installed which represents the social and economic history of the village. Carrigtwohill Tidy Towns who restored the old Village Well by building a natural stone setting around it, which both protected it and enhanced it as a feature. Bantry Tidy Towns. An overgrown area was reclaimed and a retaining wall was erected. The area was then planted with low maintenance shrubs and the area was finished off with wood chippings again for low maintenance. A feature stone placed in the centre was inscribed by local students who helped with the project. (1) Baile Roisin Tidy Towns who enhanced the area near the Bus Stop by erecting a Failte Sign and placing seating that can be enjoyed by all, maintained all the planters on the approaching roads and planted summer bedding plants. (2) Glanworth Community Council developed the friendship garden, for young and old to sit and chatsat a , Christmas tree in the garden in remembrance of deceased members of all clubs and groups who use the community centre. (3) Knockraha Community Association who cleared a derelict site to make it ecstatically pleasing to the eye. Ballincurrig Tidy Village Group who added wire gambions filled with locally quarried old red sandstone to improve the maintenance of the existing structure. This is the current phase in an ongoing project. Ballinora & District Community Council who developed a Heritage walking trail in their parish and erected an information board and map in the village and further information plaques at each heritage site. Lusitania Museum/Old Head Signal Tower Heritage Group who restored the Signal Tower and constructed a Lusitania Memorial Garden which features an iconic sculpture. Gary is our Lottery and Tidy Towns Chairperson and sits on the Finance & Fundraising sub-committee. His work these last three years has been tireless in setting up the Community Lottery which provides much needed income to help fund these incredible projects in our village. He singlehandedly designed the new Village Green, the Butterfly & Bee Garden and Church Car Park renewal as well as working closely with the County Council to secure grants and funding. Actively Involved in Community for over 30years. Elaine volunteers so much in the community. She is the Treasurer of the Camogie Club and secretary of the Ballygarvan Community Association. She works tirelessly on a voluntary basis every day. She successfully lobbied for a bus in Ballygarvan and it will start in September. She has successfully lobbied for traffic calming measures in the community. She doggedly and single-handedly chased down donations of supplies and labour for the renovation of one side of the centre. Planting and weeding in the summer months.